The final commercial passenger flight of a DC-10 aeroplane has been made from Birmingham Airport in front of enthusiasts from across the world. The three-engined aircraft made its first appearance in Birmingham in a demonstration flight in 1972. The last plane's operator, Biman Bangladesh Airlines, will now switch to using a Boeing 777. 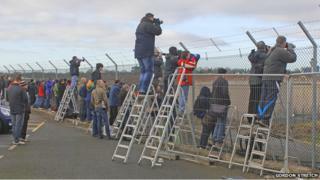 About 1,000 fans bought tickets for one-hour pleasure flights run by the company to mark the aircraft's passing. On Thursday, a group flew on the plane's final international journey from Dhaka to Birmingham and Radio 2 DJ Janice Long, who worked on a Laker Airways DC-10 in the 1970s, gave the in-flight announcements to passengers. "When I worked for Laker I never got to do the announcement, which is strange when you consider what I do now," she said. "It's going to be weird for me, and lots of memories will come flooding back, I'm sure." 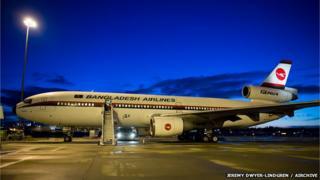 Biman originally said the plane's final resting place would be Bruntingthorpe Aviation Museum in Lutterworth, Leicestershire, but the firm has since decided to return it to Bangladesh to be scrapped. 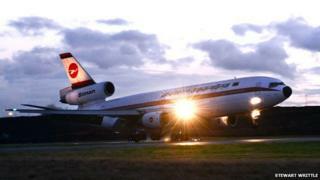 Museum boss David Walton said it had been "looking forward" to receiving the DC-10. "They said 'sorry, it's all fallen through, we've been told to fly it back to Bangladesh'. "We were hoping to replace an old 747 with the DC-10. "But you're never sure until they've got their wheels on the ground," he said. Radio 2 presenter Janice Long worked as a stewardess on Laker Airways for two and a half years from the age of 19. She said: "My job on the DC-10 was to get the in-flight film from the hold and put it on for the passengers. "It was amazing for a young girl to be on this huge plane. "There was one-flight over the Atlantic which I'll always remember. "We were in the air, then all of a sudden found ourselves inside the Northern Lights. "The captain said 'get the passengers, they have to see this'. "So one by one, 345 people came to the cockpit and were stood inside this arena of light and colour. Graham Dinsdale has been running a merchandise stall for aviation enthusiasts at Birmingham Airport since Saturday. He said 1,000 people had bought models of the DC-10 and commemorative T-shirts. "One customer from Singapore bought one of everything - it took me about half an hour to serve him," he said. Bernie Leighton is managing correspondent of airlinereporter.com and travelled from the US to be on the last flight. He was also on board the DC-10's final international voyage from Dhaka on Thursday. "It's always sad to say goodbye to another aircraft type. The skies are getting less diverse," he said. "When the plane lands I'll be happy I was on it but also sad; there's really nothing like it left now." Chris Sloan, founder and editor-in-chief of flight website Airchive, travelled from Miami to be on the flight. "I've been on a lot of first flights but I've never been on the last flight of an aircraft before," he said. "The DC-10 has had an amazingly long history - it's outlasted a lot of other planes."